The NDPP has welcomed the decision of the Election Commission of India (ECI) to dismiss the petition under section 29A of the Representation of Peoples Act, 1951, seeking cancellation of the ruling party’s recognition. The petition was filed by one Zeneisilie Ate Loucii. In a communique, uploaded on its official Twitter handle, the Nationalist Democratic Progressive Party (NDPP) stated that the ECI has upheld the sanctity of the legal system of India by passing a judgement that was unbiased and fair after thorough study of the documents and after having given patient hearings to both parties. It said the order of the ECI has further strengthened the faith of the party on the judiciary system of India and the inviolability of the ECI. “The NDPP has from the very beginning maintained our stand that the party has done no wrong and that the complaint holds no ground. 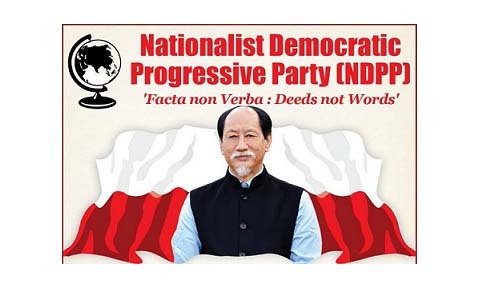 Today the order of the ECI has vindicated the stand of the party and the NDPP is truly grateful that truth and justice has prevailed,” the communique said. Asserting that it is a people-centric party, the NDPP said it is committed on tirelessly working for the welfare of the state and its people. “The party never has and never will mislead the people with rhetoric’s and false claims. We firmly believe and adhere to our motto “Facta Non Verba” and will continue to work on the strength of the words,” it further said. The party reiterated its commitment to work for the development and uplift of the state and its citizens. Stating that the party will not be distracted by rumours and false accusations, it said the party will work for building a new Nagaland, hand in hand with the people under the banner of transparency, accountability and good governance. “We have always been confidant that the people are wise enough not to be misled by those who manufacture lies and dwell in political rhetoric and constantly undermine the wisdom of the people. The NDPP will continue to carry the voice and aspirations of the people,” added the communique, issued by the party’s Media & Communication Committee.